So took out the alternator and had it load tested its putting out 14.5v with lots of amps ,altinator repair shop says its good. My inside light has also be staying on so pulled the bulb out. So yes i found that i was only getting 12.5 at the battery with the engine running at idle. The battery is at 12.5v with the engine off. What is the purpose of the small wire to the altinator? The thin wire(brown/yellow) is the earth path for the warning lamp, the lamp has feed on the other side and when the alternator is not charging the lamp is on and when the voltage on that thin wire is rising the lamp goes out as it gets feed from both sides... the alternator is three-phase is with self excitation. 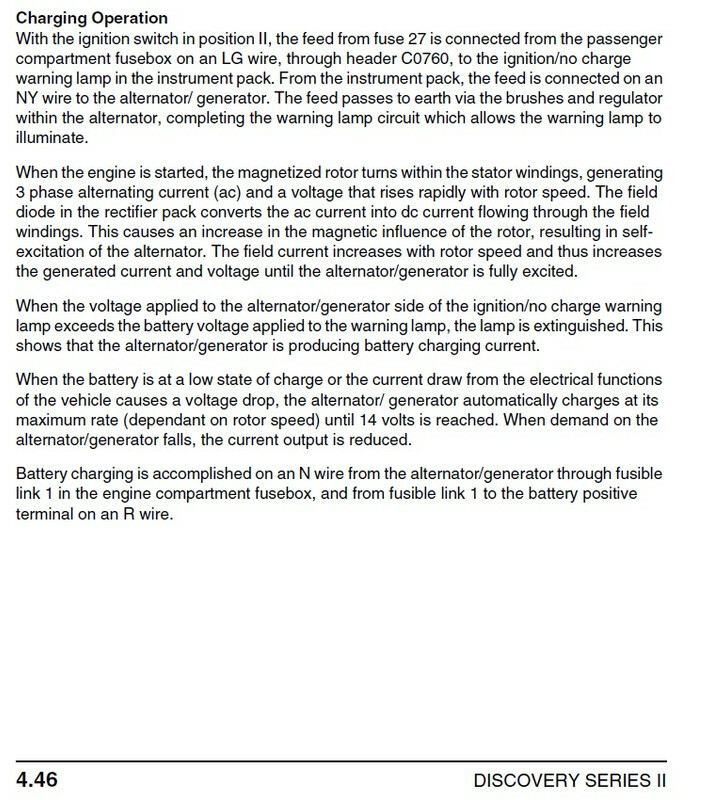 so check continuity on fusible link FL1 in engine bay fusebox which is on the alternator's output to not be shot cos that would not let the charging to reach the battery also unplug that thin wire and give it 12v with a wire(ignition on II) and if the warning goes out then IMO you need another alternator cos even if your's has power output on the bench it might not energise that thin wire. Last edited by sierrafery; 03-20-2019 at 10:54 PM. I had a similar problem in my Series IIA, and in my case, besides installing a new alternator, I figured out that the alternator warning light in the metal dash was grounded - to the dash - so lit up all the time. Here's how I figured it out. I unplugged the warning light wire from my alternator. With ignition on, my light was still lit. So I realized it had nothing at all to do with the alternator. The bulb had to be somehow grounded to light up. Installed a better insulated bulb housing, and now works perfectly - light goes out after start up with a reassuring flicker beforehand. Maybe a different problem than yours, but you may want to make sure the bulb is not grounded itself, making the alternator wire feed to it useless on account of the bulb already being grounded regardless of the alternator 12v feed wire.